One of the Last Vermont Col.
Col James H. Walbridge, who has been in failing health for several years died at his home in North Bennington at one o'clock this morning. 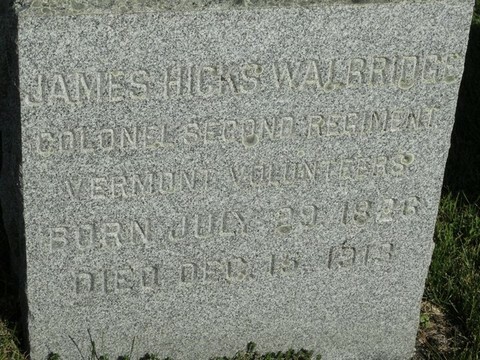 Colonel Walbridge was the organizer and captain of company A, Second Vermont regiment of volunteers and was one of the few survivors among the 51 officers who at different times during the civil war held regimental commands over Green Mountain state troops. The second regiment composed the first body of troops from the state of Vermont to be enlisted for three years and was mustered into service at Burlington June 20, 1861. Captain Walbridge's company was composed almost exclusively of Bennington county recruits. Many of them re-enlisted when their terms expired and served through the entire war. Up to the time he observed his 85th anniversary Col. Walbridge had retained the remarkable mental and physical vigor which had carried him through the trying periods of an unusually active life. Early in the winter of 1910 he experienced a severe attack of grip and since that time his slight military figure has been missing from the streets of the little village of North Bennington in which he passed the larger portion of his life since he resigned his command in April 1864. Few men now residing in Vermont have lived lives of more varied activity. During his youth and early manhood he was a sailor before the mast, California gold prospector, pioneer, printer, member of the vigilance committee that made the first restoration of law and order in San Francisco, three years an officer in the first fighting regiment that Vermont sent into the civil war and after the war went to Panama where he was superintendent of docks when the late Trenor W. Park was president of the Panama railroad company. So far as is known he was at the time of his death the only person in Vermont who possessed a certificate of membership in the "Home Guard of San Francisco," the organization that drove the lawless element out of the city of the Golden Gate in 1856 and he treasured it more than any of his personal belongings. 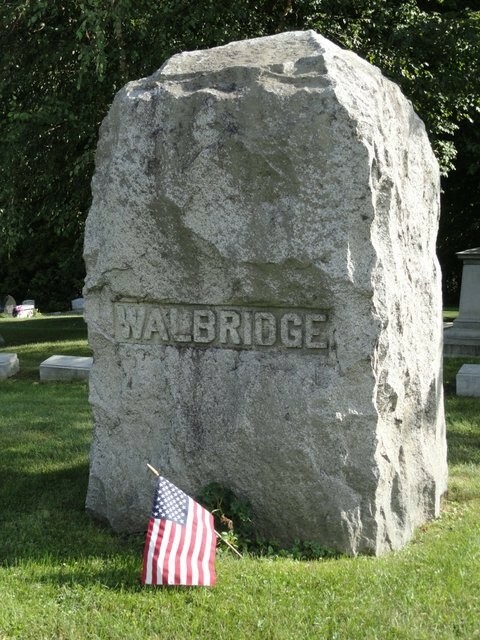 Col. Walbridge was a native of Bennington, having been born July 29, 1826 in Hinsdillville, a small manufacturing hamlet about two miles from the home in which he passed away. His father, Stebbins D. Walbridge, who was also born Hinsdillville, was a farmer and woolen manufacturer and the son when a small boy learned the trade of a weaver. When but a youth he showed evidence of that restless but sturdy energy which during three years of service resulted in his promotion from a captaincy to the head of a regiment with a record of 28 of the severe engagements of the civil war and which in the number of men killed in action stood 24th out of over 2000 enlisted in the federal army. At the age of 16 he left home to become one of the crew of a mackerel schooner which cruised off the Massachusetts coast and followed the life for two summers, being employed during the winter in his father's woolen mill. During the year that he was 20 years old he went to Springfield, Mass., and worked for three years in the paper mills of that city. From Springfield he went to California early in 1852. The journey to the Pacific coast was accomplished by the way of the Isthmus of Panama which he crossed by traveling in a canoe manned by Indians to the head of the Chagres river and walking the remainder of the distance. Upon his arrival in California he went immediately into the mountains and worked for a time in the placer mines. He panned out sufficient gold to give him a start in business and located in San Francisco. There was no opening for his trade, that of a paper manufacturer, so he went a step beyond and became a printer. He had shipped to him from the east the first power job press operated in the city. For a period he located in Sacramento in order to the printing for the state but found San Francisco more congenial and returned to that city. Col. Walbridge became a member of the vigilance committee in May, 1856, when that law and order body was re-organized immediately after the assassination of James King of William, founder and editor of the San Francisco Evening Bulletin. Together with his brother, Edward, who died at the old Walbridge home in Hinsdillville in May 1909, he marched musket on shoulder from committee headquarters to the jail where the murderer named Casey, also a newspaper man, sought a refuge and assisted in taking the man out of the hands of the authorities. He was also on duty four days later when Casey and another murderer, after a trial by the vigilante court, were hanged from the second story window of the large storehouse in which the committee held its meetings. Returning from California in 1857 Col. Walbridge purchased the farm at Hinsdillville originally settled by his great-grandfather and was carrying on the property when war was declared between the north and the south. He served from the first battle of Bull Run until April 1864 when he was discharged for disability, having contracted a spinal diffaculty from which he never fully recovered. For 15 years following the close of the war he was assistant of internal revenue and later was for a about a year in the employ of the Panama railroad company. He was a member of the GAR and of the Loyal Legion. Col. Walbridge was twice married but the only surviving relative other than nephews and nieces are a brother, H.S. Walbridge and one son, George Hicks Walbridge, a graduate of Cornell university in the engineering department now living in New York. His first wife, whom he married in 1862, was Miss Eliza A. Burgess of Hoosick, N. Y. His second wife, whom he married in 1867 was Mrs. Delia Bruce of White Creek, NY. The funeral will be held from the house in North Bennington Wednesday afternoon at 2 o'clock.